If you want to hear more about the political and theoretical ramifications of the film from someone far more informed than I, look here. Look here for a taste of the various obsessions from the film . . . for there are many . . . as befitting the promise of the title. 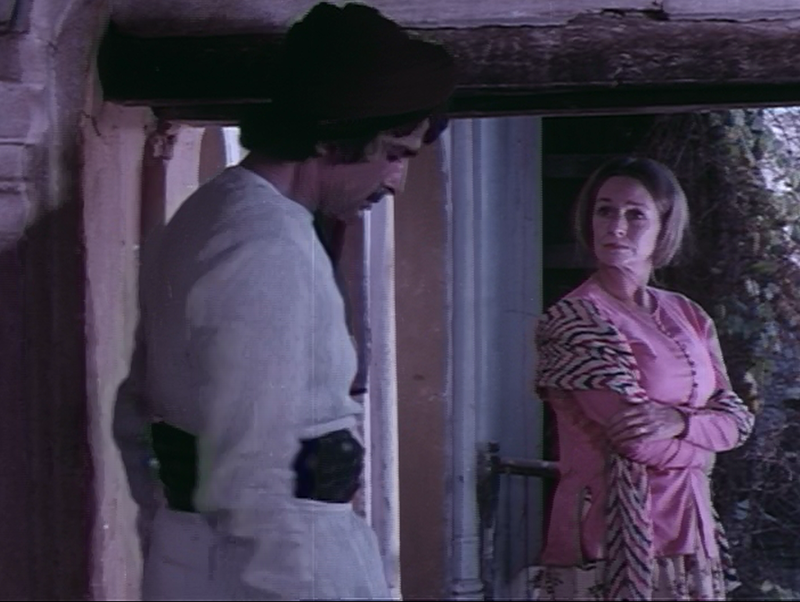 Shabana Begum really wants some marital frolics from Shashi as the the grumpy Nawab. . .
Shashi the grumpy Nawab wants Nafisa the Anglo-Indian he has placed "under his protection" . . .
Nafisa the Anglo-Indian just wants to be a bonnetted little girl forever and have fun . 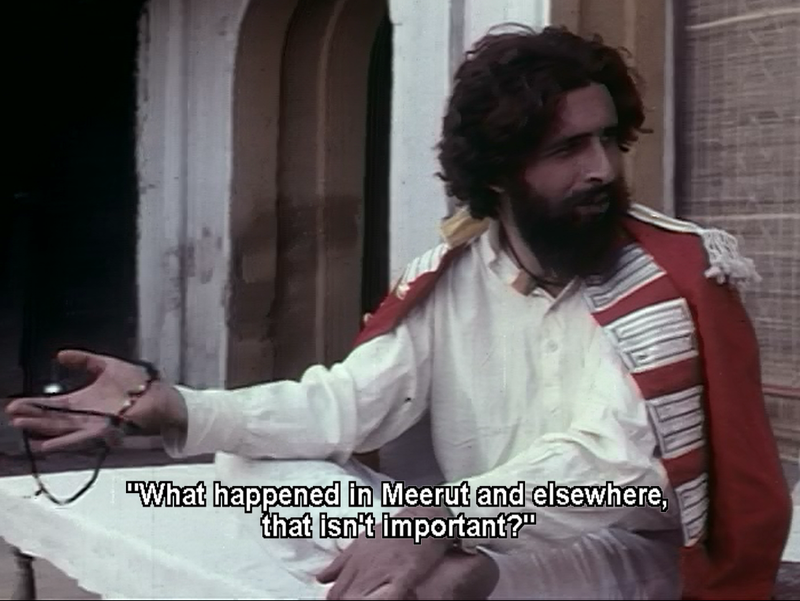 . .
Naseeruddin Shah's bearded revolutionary wants India to be for Indians. . . 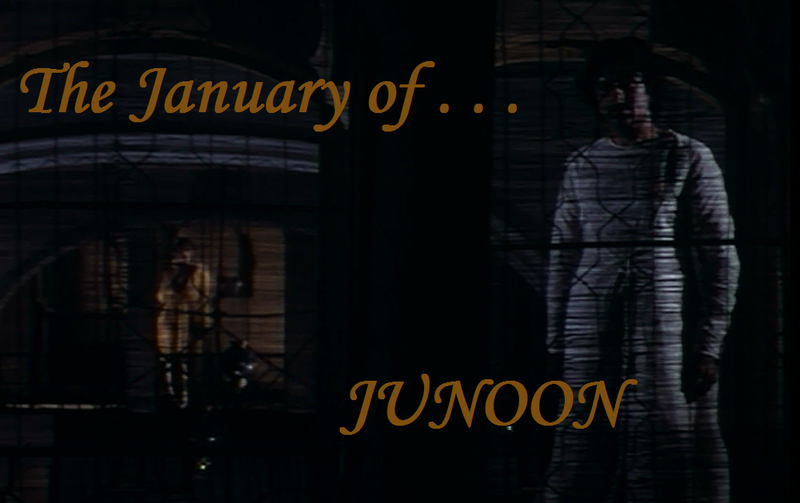 So, it's no secret that I've been focusing on the word/theme of "junoon" this fine January. 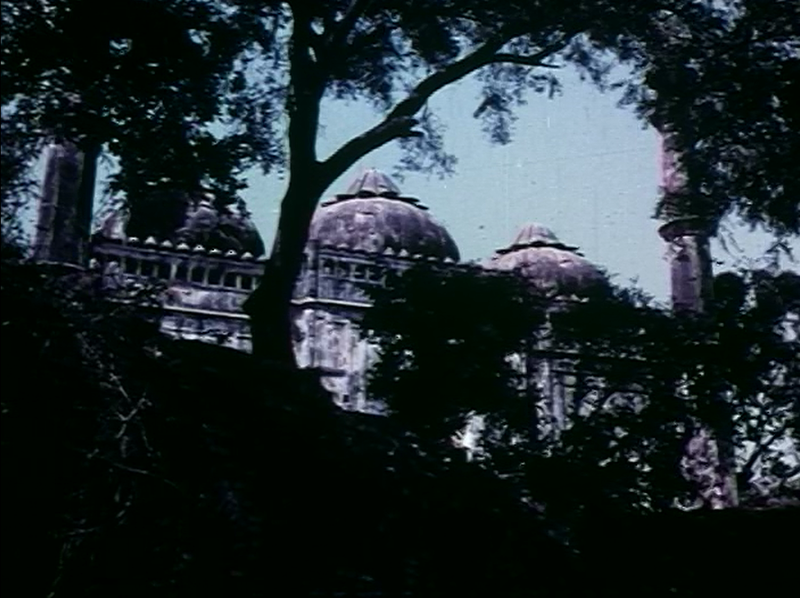 And not subtly, I am wrapping up with the "original" Junoon--the film that inspired it all. 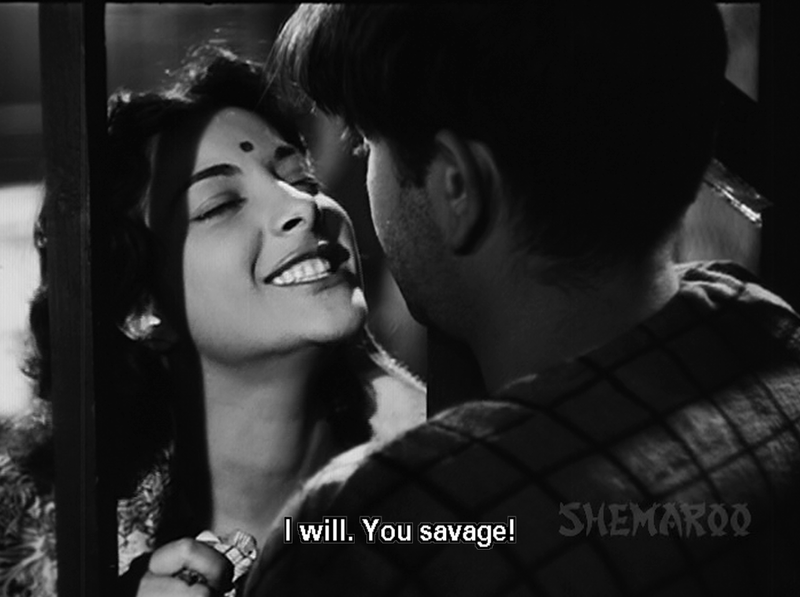 I love that this story is a commentary on both political and interpersonal relations--something that Dil Se (1998) and Senso (1954) and I'm sure a whole lot of other films about romantic obsession do as well. I also love that this film doesn't feel the need to tell you what to think. You're plunked into the middle of two family's lives during the 1857 Rebellion against British rule . . . and instead of spending a lot of time in the broader tempest of colonist/Indian relations, you find yourself in a queer calm; an eye of the storm in the midst of the outer madness. You wonder whether the Nawab wanting a British "woman" is supposed to be a metaphor. You wonder if the British woman/women "using" the Nawab temporarily for survival reasons is meant to be symbolic. You wonder if the fact that no one who wants something intangible (like an object of passion, a way of life, freedom from oppression) gets what they want in the end . . . if that fact is supposed to say something universal about the human condition. But I especially wonder about the Nawab--the central, yet most ambiguous character of the story--and whether his actions or his inaction(s) speak better for his inner character. He is neither savage enough to take what he wants, nor loyal enough to be content with what he already has, nor clever enough to think up a way to change the game in his favor . . . which makes me ask, "Is his junoon is his best quality or his worst?" And I don't think I'll ever know. Perhaps it is both/and. Perhaps it very like the way a rebellion or revolution can be both a country's greatest achievement, and its' greatest tragedy. Perhaps. Or perhaps he is just a stand-in symbol for a movement, a mission, a passion that is not willing to do what it takes to win all. And if that is the case, his problem is not in his obsession, per say, but in the limits of his obsession. And a junoon that is not willing to die, to be extinguished, to be lost forever in its object, can it truly be called junoon at all? 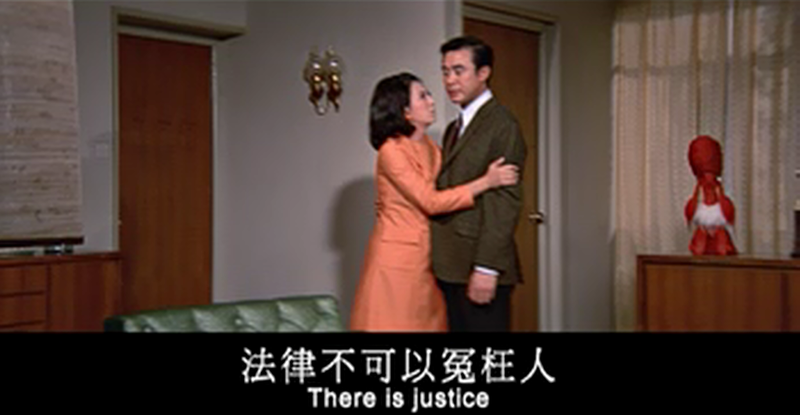 Here, the murderer is symbolized by a pink purse on a single, fashionable bed . . .
Could it be? Yes it is. 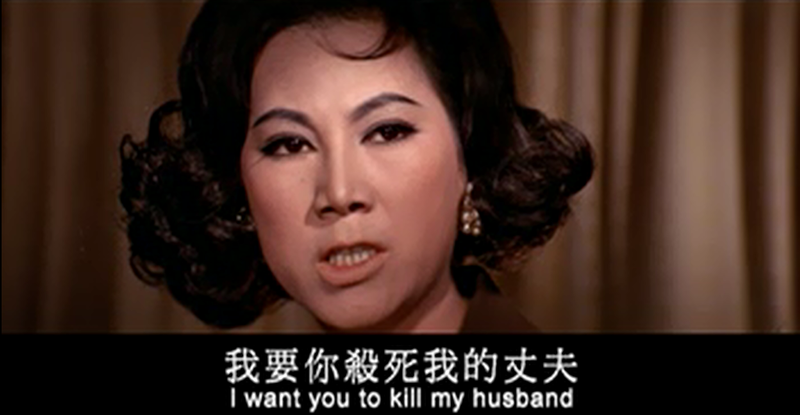 This is a pulpy Lifetime movie Hong Kong *Noir film chronicling the schemes of a murderous housewife. 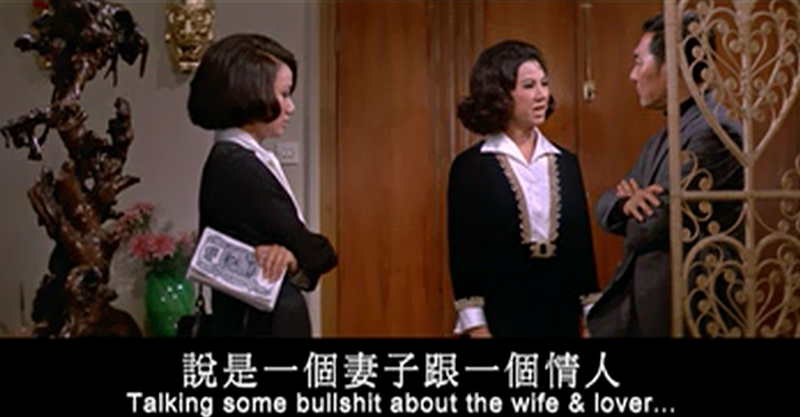 Ivy Ling Po, of Shaw Brother's Huangmei opera fame, plays Sin Lei, a retired actress who can't quite seem to get over that one time her publisher husband had an affair . . . and that time he didn't admit to it even after she went through all the trouble of blackmailing him. One wonders how she manages to keep any strong feelings burning in the direction of these adulterous pudding faces (see pudding-faced-guilt below). . . but there's no accounting for one's taste in murder victims. 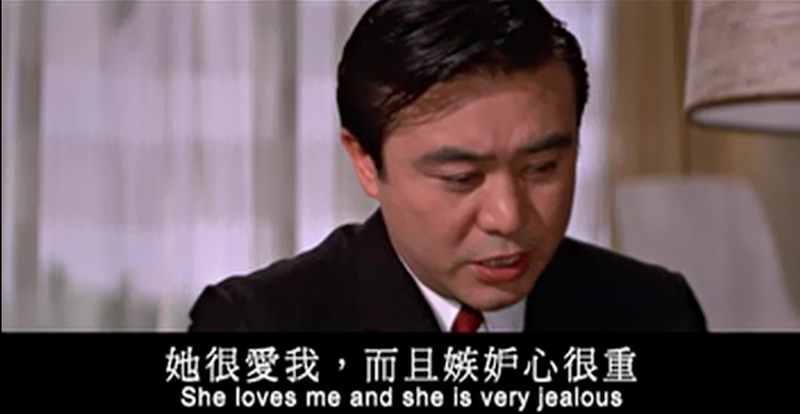 Let's be clear, despite the theme of this month, this movie is not about obsessive love, but rather an obsessive need to take revenge for a series of petty slights. Sin's big murder plan (that she blackmails another fellow into carrying out for her) doesn't make much sense. She seems to have chosen the spot of her husband's demise--the film developing room--less out of practicality, and more out of the convoluted meaning she derives out of the place itself. The murder is scheduled neatly for the next evening, when dear hubby will be home alone working on his photography, and wifey is scheduled to be at the nightclub with colleagues. It's not an Asian nightclub in the 60's without a pasty blonde item girl. Of course things begin to go wrong almost immediately, and when the murder is attempted, one can't help but notice the fact that the hired killer does not look very confident in his own skills. 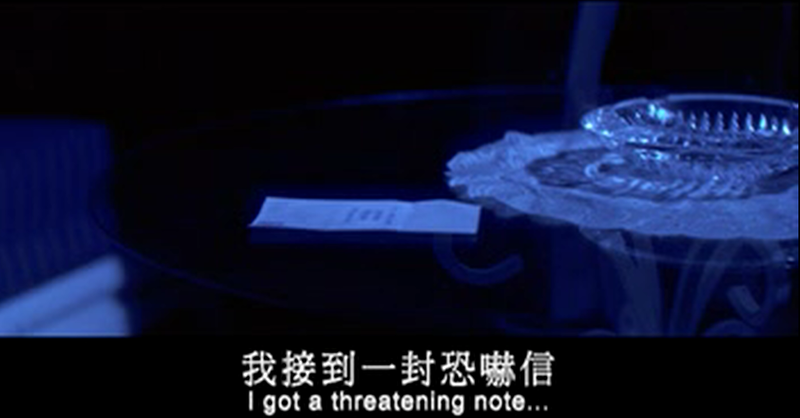 And wouldn't you know it, he had good reason to be worried, for this is a Hong Kong movie . . . and even tweedy publishers are secretly trained in Kung Fu. Hubby stabs his attacker with a pair of scissors, and then calls his wife in a panic. The police are called, hubby goes to bed at his wife's command, and wifey tries to remove any evidence that could link the assassin to her. But when the police arrive, who is going to look like the bad guy? The killer, the would-be murderer, or the murder-planner? If you guessed this film might be heading toward an "innocent man is framed" trope, you're not the only one. Hubby guesses as much when he wakes up the morning after. When Sin says, "It was self-defense . . ." he replies, "I still killed a man." My guess is that he's seen a lot of Hindi films. Will hubby be framed forever? And will be pudding face #2 be called up to convince the law of her old flame's innocence? Extra points for this detective's (on right) energetic and smooth style (courtesy of actor, Huan Tsung-hsun), making even a conversation with the PF#2 (on left) seem interesting. 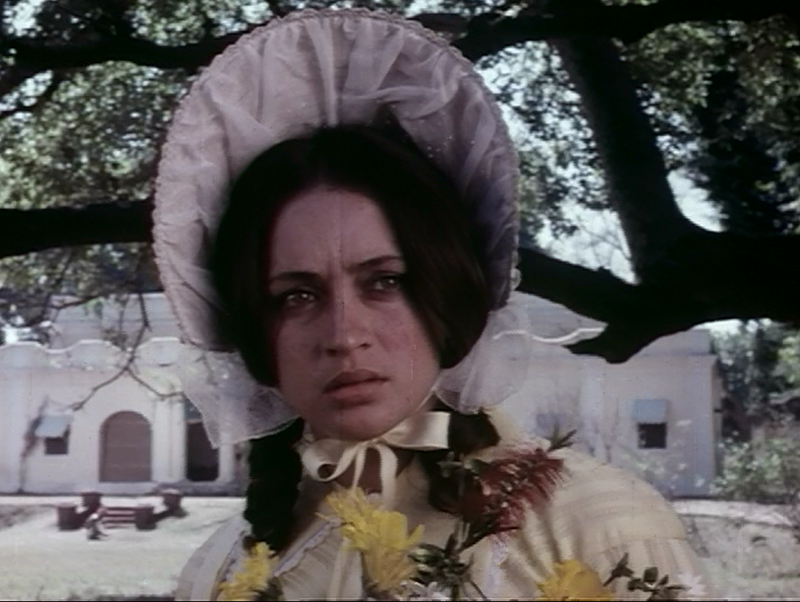 And should this woman go up against Sharmila Tagore and Helen in the race for the MOST VAMP-Y EYE MAKEUP of 1969 award? Ling Po is a new fascination of mine. Known for her gender-bending roles, there's certainly a masculine quality to her presence, if not her figure. Whether it was because of all the young male characters on her filmography, or because of an inner trait of unshakable forthrightness, Ling Po projects a calm confidence I have yet to see in another female actress from the period. In the roles I've seen, she doesn't waste much time attempting to allure the audience (or other characters) . . . instead she uses her wits and good-old-fashioned intimidation to get what she wants. I also liked the shifting tones of this film, from modish pink and green upholstery to the use of shadow and the conversations by the light of cigarette. But, considering the length of this film (only 98 minutes), there's really no excuse for the time it takes to get going. Almost nothing happens in the first 20 minutes . . . nothing that couldn't have been condensed to five. The actors (with the exception of the oddly energetic Iftekhar police inspector) always seem to be perilously close to snoring under the soporific effects of the material they are given. The real murder here is of the dialogue . . . which is strangled by repetitive and needlessly diluted exposition throughout. 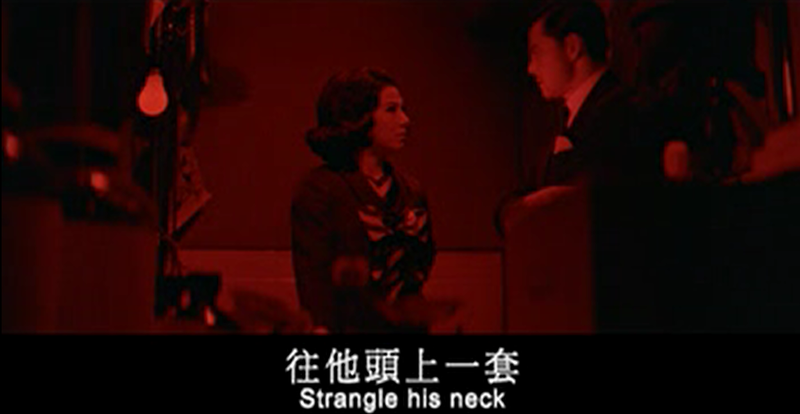 This is one of the only times I've thought that a film would have been more interesting to watch without subtitles. Especially since it would have created some real mystery in a not very mysterious story. Someone behind this script obviously thought "suspense" was synonymous with "sluggishness." Actually, PF#2's name is Su Su and she has a nice comic sideplot revolving around the ironic nature of her profession: mystery fiction writer. I'll also admit that at this point in the film, I actually started liking her. 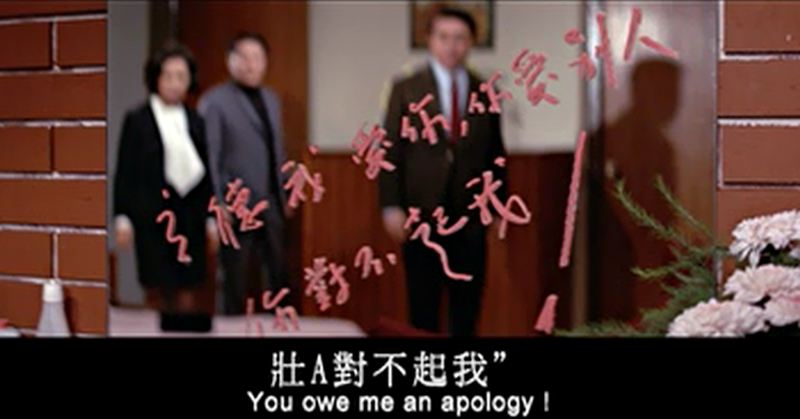 I will say that this film gets better as it goes along, and Sin Lei and PF#2's warring attempts at creating false stories about the cause of the murder is fairly clever stuff . . . Even Sin Lei is a little impressed with her rival.
. . . and sometimes it's even a little funny. Just a little, mind you. And, *spoiler* Sin's parting "shot" at the end is also just about the best thing I've ever seen. Also, in miscellaneous news, apparently Pakistan has been the stereotypical place where villains go to hide out for more than a few years. 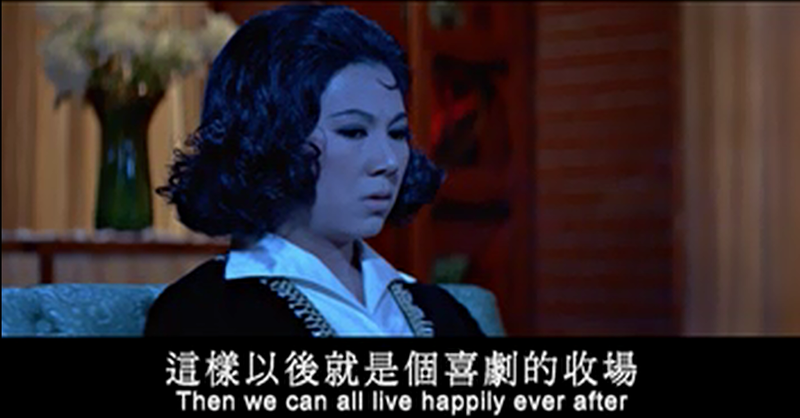 I originally took a chance on this film based on Ling Po's unusually pulpy role in it . . something I HAD to see after watching her act under the the physical and vocal constraints demanded by operatic spectacle. 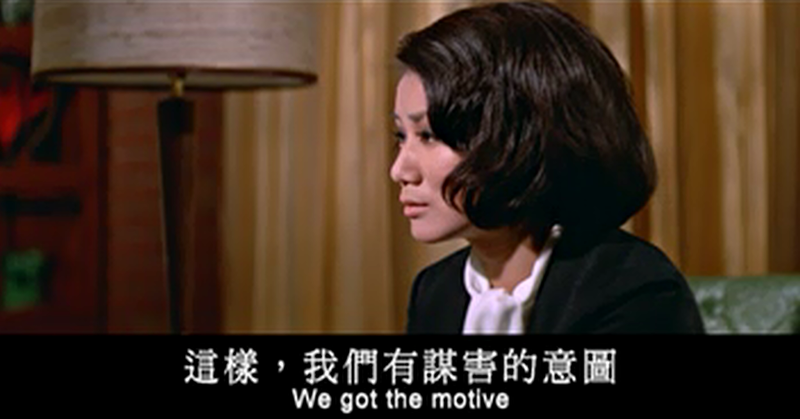 In that aspect, I really wasn't disappointed, and also I think I could really get into other Hong Kong thrillers/pulp from this period. (I'm sure some have to be more fun than this.) I just wish Ivy Ling Po could be found in more of them. All of these scenes are by and large "junoon" moments marooned in non-junoon stories. They range from slightly k*nky to the kind of violent . . . and they tend to take place between characters who strive for healthy dynamics (in filmi terms at least) at other times and places in their relationship. Also, all of these films were big hits, and not just cult anomalies that slipped through the cracks in the public's sensibilities. Words fail me when trying to describe 80's masala. It is perhaps enough to say that this movie makes little sense, except for the romance, which makes no sense at all. Is it twisted when a guy who wasn't in love with you before you refused him decides to jump off a building just to spite you . . . just because he promised he would if you wouldn't admit undying love? Or is it twisted when months later, after a lengthy recovery (pictured in five rehab stills), the same guy writes you a letter (of unknown content), after which you sing of your regrets about "how things went down" rather literally and proclaim oaths of constancy on pain of death? I really don't know. Maybe it's just chemistry, but on Bollywood crack. So, to sum up the important bits. 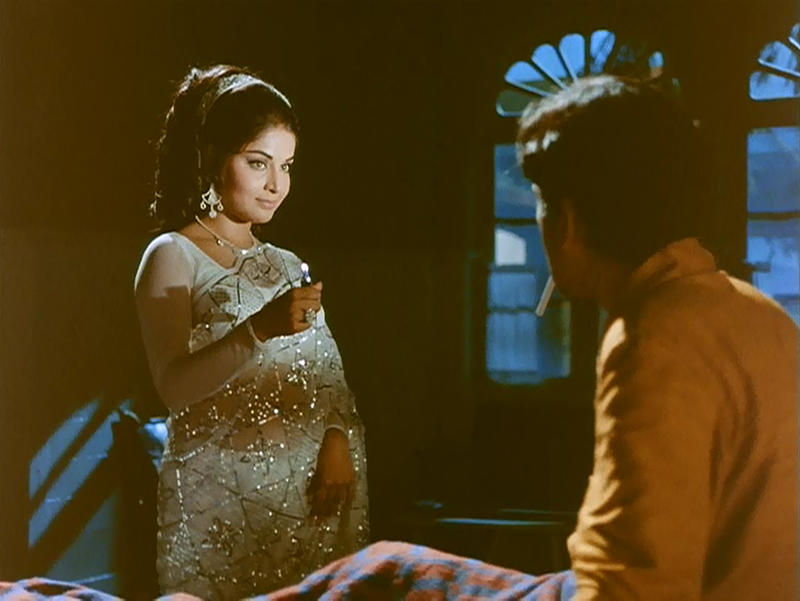 . . Ajit falls in love with the Kamini, the evil twin (Rakhee). But he accidentally gets engaged to the good twin, Kanchan, (also Rakhee). Good twin falls in love with her fiancee, but is rejected when evil twin returns and clears up the misunderstanding. Evil twin and Ajit frolic, good twin pines away. Evil twin is sucked back into the vortex of her naughty past, and good twin is forced to marry Ajit, be rejected as herself, and then save Ajit by pretending to be her evil sister. The plot is rather twisted . . . that's really not even the half of it! Plus, Shashi (in general) can be counted on for some rather twisted courting practices in more than a few of his roles, in which he summons up the Kapoor "inner monster" (see below for more). In this film, the monster is let out of its' cage more than once. 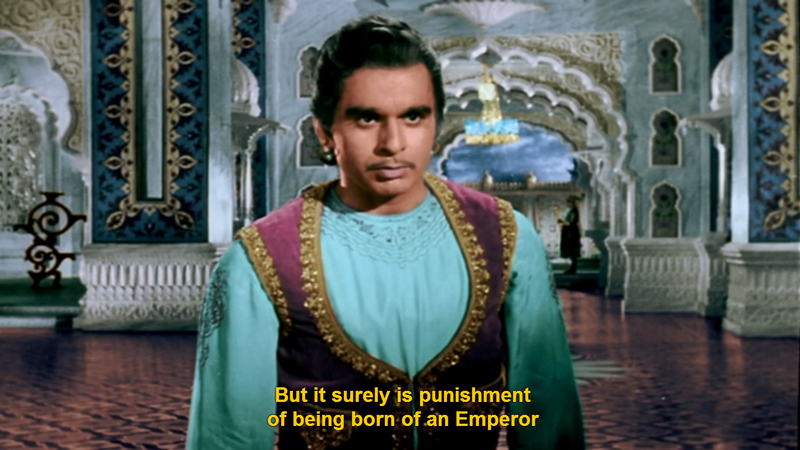 In a scene that made me hate his character a little, Ajit chokes the good twin, "frustrated, shall we say?" that she is not her sister. 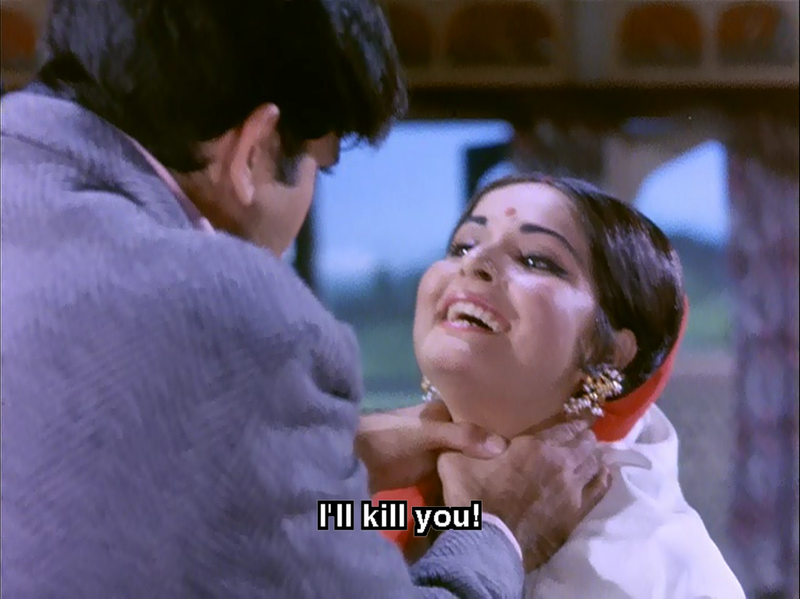 But in a stroke of genius (on the part of Rakhee AND her character), Kanchan doesn't recoil in fear. 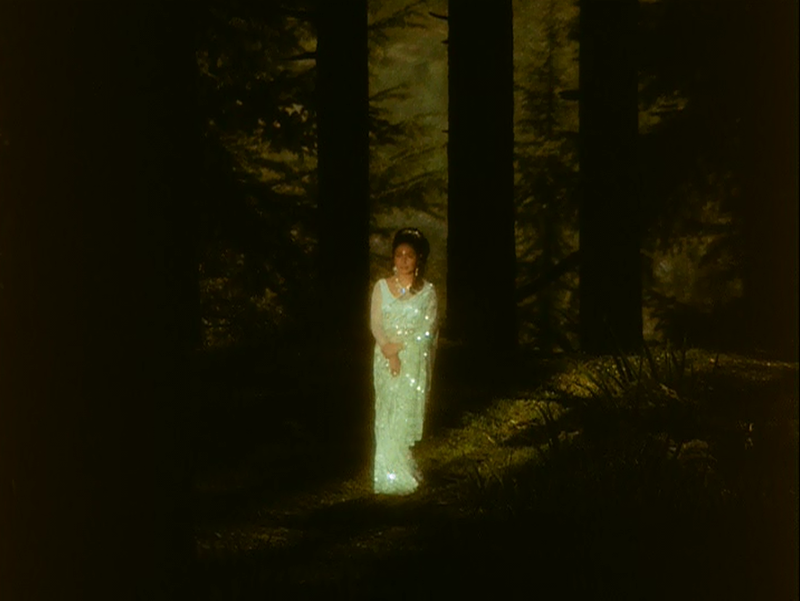 Instead of kowtowing, the good twin turns herself into the evil twin, harnessing her own power, and effectively halts Ajit's violence with an eerie laugh. 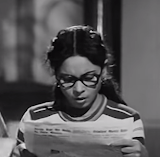 She gives a scary good impression of Kamini, and Ajit turns back into his fluffy self. It's a twisted moment not just because we wonder if the good twin is really the bad twin, or perhaps is starting to turn bad . . . but we also wonder if Kanchan, so long a doormat, actually is starting to enjoy being pushed around. Now that she can turn it to her own advantage, that is. 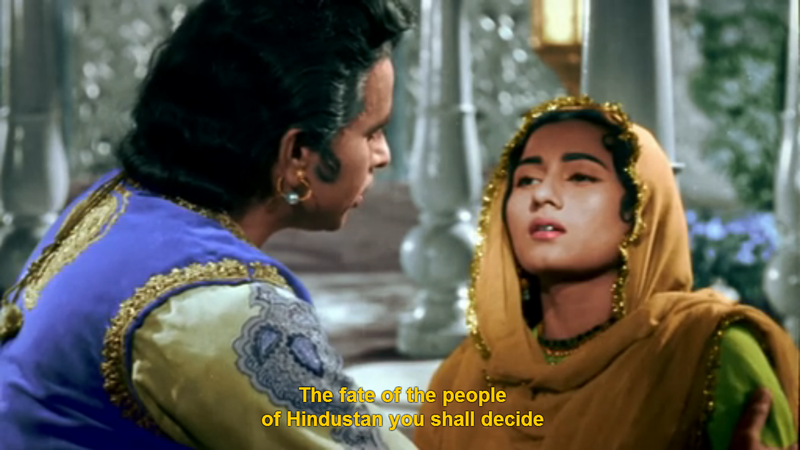 The weird power dynamics between Kanchan-playing-Kamini and Ajit as the somewhat petulant army captain, may smack of abuse. But these same dynamics are also mindbendingly empowering and maturing for the painfully shy Kanchan . . . and the plot arc somehow manages to sidestep looming interpersonal violence and eventually institute relational harmony. 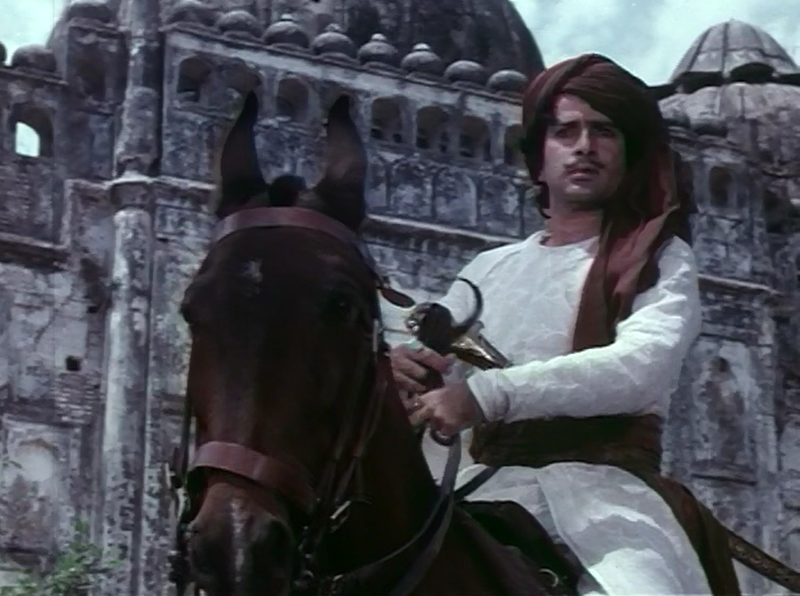 Salim may have gone down in the annals of myth (filmi and otherwise) as the man who would sacrifice everything (power, wealth, position, life) for love . . . but he still romanced like a royal. His command of Urdu is his greatest tool, and he knows it. A common lover might dream of his beloved's acceptance by his family, and the beloved might find the hope a comfort. But, since Prince Salim is very much a prince, he dares to dream bigger. 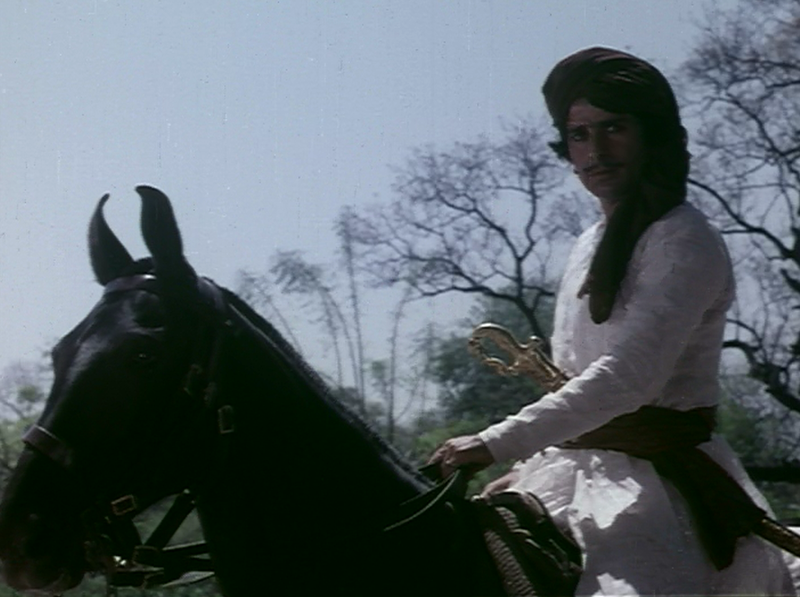 In a scene that shocked me when I first watched it . . .and still strikes me as one of the most ambiguous moments in the film, Salim teases Anarkali with the idea of a future where she rules Hindustan . . .calls the shots, or the gallows (whatever execution practices Mughal's preferred for the common folk) . . . and generally wields the ultimate power over the Mughal territories. 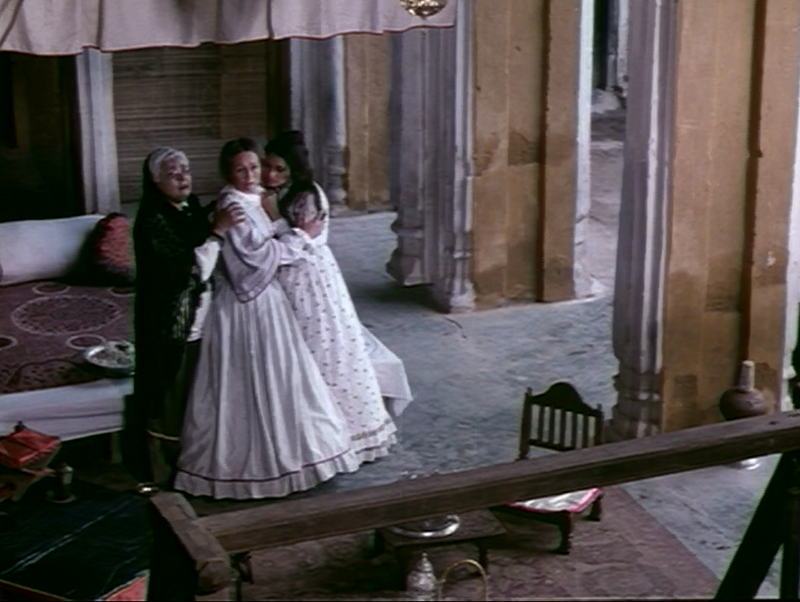 I find the scene fascinating partially because I personally can't tell if Anarkali is (A) Turned on by the potential for great power; (B) Distressed by the potential burden of power; or (C) Caught somewhere in between both sentiments. Her 'O' face (above) is just too easily confused with her misery face. Yet, it seems important to know what she feels. Going by the qualities showed by her character elsewhere in the film, I lean toward the opinion that she is indeed turned on here. . . but by the possibility of acceptance and peaceful existence as Salim's bride, not by any chance to wield authority over the masses. Salim, however, probably IS turned on by the thought of the beautiful slave girl transformed into a powerful queen. And hey, who can blame him? 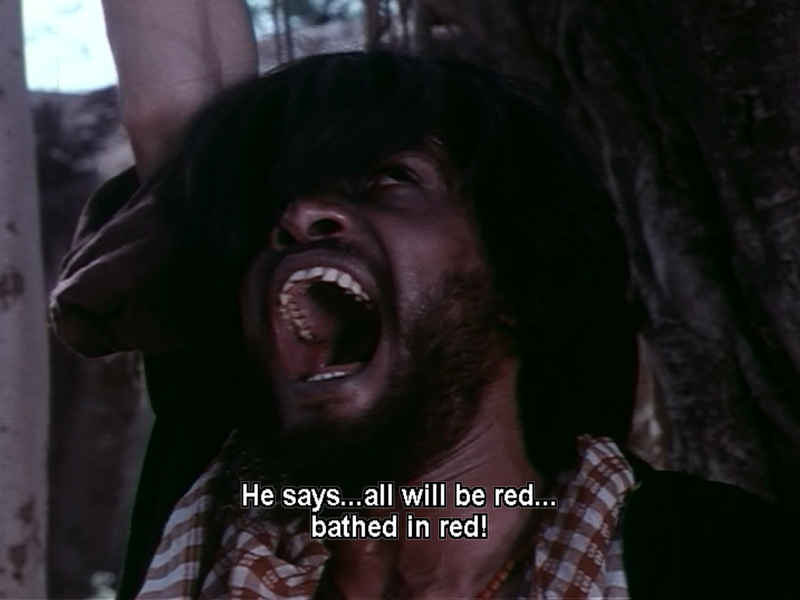 One could argue that he is punished for this desire later (this is a Hindi film, after all) . . . but I'm inclined to like him more just because he isn't intimidated by the idea of yielding to a woman's authority, unlike his father. Raj and Rita come from very different backgrounds . . . and their personal history has been periodically poisoned by the shame of their class difference . . . a shame that Raj cannot seem to shake. After a particularly shaming experience, Raj acts on both his long-held desire for Rita and his long-nurtured bitterness toward her social milieu. The scene is a long one . . . and it vacillates between moments of giddy fun (swimming and frolicking) and angry/controlling outbursts from Raj. One moment he is shaming her in his intelligent and acerbic way for her people's classist prejudices (and her tacit approval of it . . .from his perspective at least). The next, the banter is all in fun again. 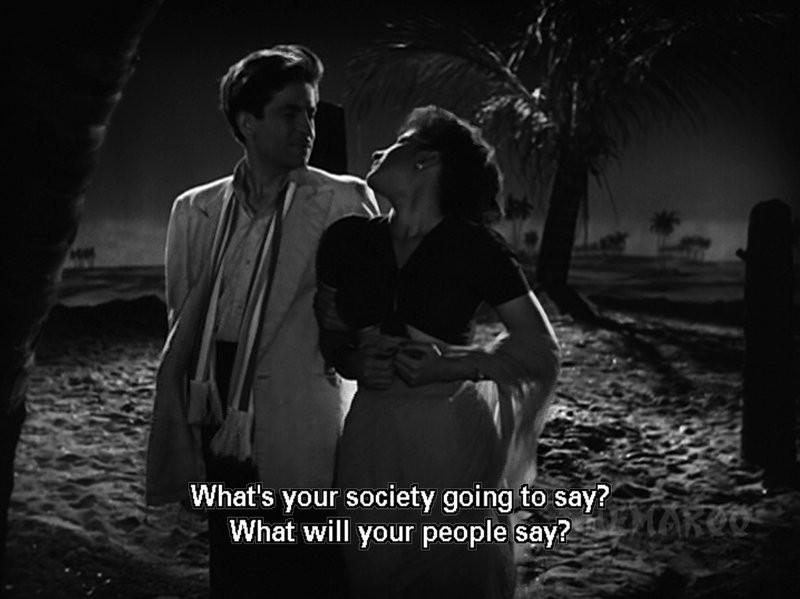 But the real twisted aspect of it arrives when Raj forces Rita to submit to him, both physically and mentally, and not only does she acquiesce. . . But she also seems to get off on it. Course, this isn't exactly a compartmentalized theme. Throughout the story, Rita seems to like Raj just the way he is, inner monster and all. Perhaps that's the secret element in transforming a junoon story into a love story. And just as she is processing the fact that he does not, indeed, have any interest in her *ahem* shop . . . Rahul decides to take the bangles she is interested in and SLOWLY, ever so SLOWLY, push them over her wrist. It's obviously uncomfortable, but she doesn't try to move away, as she is mesmerized by the romantic dialogue Rahul is spouting in his measured and charismatic fashion. 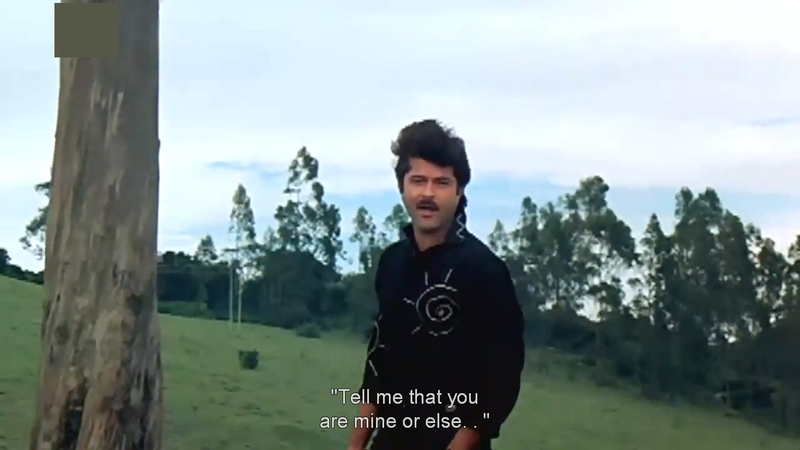 Interspersed with the monologue about the difference between everyday bonds and romantic bonds, Rahul says three or four times, "I hope this isn't hurting you . . ." all the while continuing to "force" the bangles upon her. And finally, when the bangles have "arrived," she gasps. If you haven't seen this, I swear I'm not embellishing this at all. I'm actually toning it down. 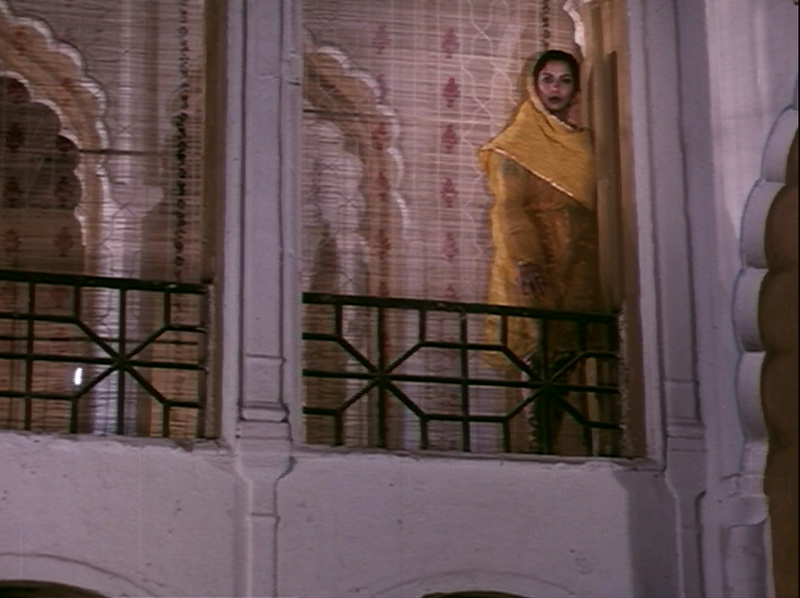 I've yet to see a bedroom scene in Bollywood that manages to be as sexually charged as this. (Proving again that one doesn't always need the literal when one has the metaphorical.) 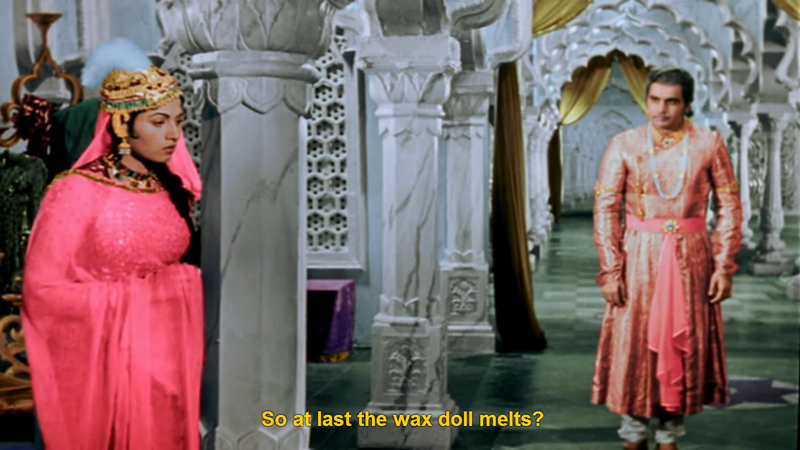 And beyond that, one can't help but admit that the sensuality of the scene isn't your average sugary sort. However, Anjali doesn't complain, and their later marriage seems to be a harmonious one, so I'm certainly not going to point any fingers. Tell me what scenes you think deserve to be on this list!